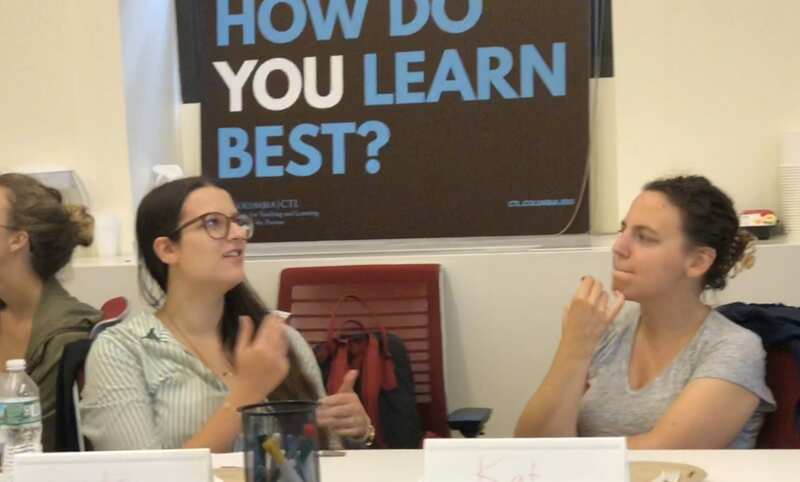 Teachers’ Lounges and Language Lounges are a series of informal discussions about teaching practices and the culture of learning at Columbia. Our conversations often introduce participants to related educational models, research, and theory, and invite dialogue about their pertinence to day to day teaching. In 2018-19, CTL Lounges are exploring the benefits of helping students to assess and monitor their own learning, a process known as metacognition. Session details and registration links are below. Graduate students can sign up for the CTL email list to receive timely updates on upcoming events. This year, Teachers’ Lounge will host a series of conversations around the benefits of helping students assess and monitor their own learning, a process known as metacognition. Research shows that students benefit from metacognition in many ways. It helps them to recognize gaps in their knowledge, recognize and develop expertise, and understand how their multiple identities impact the way they learn. As we discuss tactics to help students take ownership of the learning process, we’ll be paying special attention to ways that this can increase equity and inclusion in the classroom. This session began with a discussion of the divide between instructors and students as expert and novice learners, respectively. What frustrated us as students when learning a new subject? What are instructors’ blind spots when teaching novice learners? We then sampled the Decoding the Discipline process, which entails instructors identifying bottlenecks in student learning, and conversing with peers outside their discipline to define mental operations that can be modeled for students. Here are slides and the session handout (CU access only). In this session, we explored ways to enable students to take firmer control of their learning. What tools, attitudes, and resources do students need to drive their own learning processes? How can instructors equip students to recognize shifts in their metacognitive abilities? Our conversation was coordinated to the Cycle of Self-Directed Learning outlined in Ambrose et. al., (2010), How Learning Works: 7 Research-Based Principles for Smart Teaching. Many specific tactics generated by participants and CTL are included in the session slides (CU access only). This year, Language Lounge is hosting conversations around the theme of Metacognition: Becoming Expert Language Learners. Research shows that increasing students’ metacognitive training–their ability to monitor their own learning, self-assess their progress, and identify areas in need of improvement–helps learners improve their language performance. These sessions will help graduate student instructors build their own metacognitive awareness and devise ways of sharing those self-monitoring strategies with their students, emphasizing student growth, agency, and self-motivated practice in and beyond the classroom. This is the third of four sessions in a yearlong conversation around Metacognition: Becoming Expert Language Learners. We encourage you to attend any or all of these sessions! In this session, we’ll explore through the lens of growth mindset how issues of identity (e.g. novice or beginner, native speaker or non-native speaker, etc.) factor into the motivations and roadblocks students face and how to support students through these hurdles to maximize equity in the classroom. In the next session, we will concentrate on students’ reflection and language practice. How do we cultivate student-driven habits of practicing language skills beyond class time? This session is facilitated by Ian Althouse, Center for Teaching and Learning. Lunch provided. This is the last of four sessions in a yearlong conversation around Metacognition: Becoming Expert Language Learners. We encourage you to attend any or all of these sessions! In this session, we will focus our discussion on students’ reflection and language practice. How do we cultivate student-driven habits of practicing language skills beyond class time? What role does reflection play in students’ language learning, awareness of their successes, and shifting student self-identity over time? This session is facilitated by Ian Althouse, Center for Teaching and Learning. Lunch provided. Mark Phillipson and Amanda Irvin (Teachers’ Lounge) & Ian Althouse (Language Lounge). Teachers’ Lounges this semester initiated a series of conversations around the benefits of helping students assess and monitor their own learning, a process known as metacognition. As we discuss tactics to help students take ownership of the learning process, we paid special attention to ways that this can increase equity and inclusion in the classroom. In this session, we explored ways in which various identities and affinities may connect to learning habits and assumptions about the learning process. We discussed questions such as, How do one’s various identities affect the way a learning task is regarded and worked through? How might we as instructors encourage students to recognize aspects of themselves that are pertinent to the way they think about learning and the way they confront challenges intrinsic to our given discipline? Slides: Columbia affiliates can access session presentation slides. Resources informing this session: CTL’s Metacognition portal, Tanner (2012), “Promoting Student Metacognition“, Lee et. al. (2017),Teaching Interculturally, and Oyserman & Yan (2017), The World As We Know It: The Culture – Identity – Metacognition Interface. In this session, we discussed how to motivate students to take ownership of their learning processes. We first considered metacognitive impediments that may be experienced by students in a class they do not consider valuable, welcoming, or a setting in which they expected to be efficacious, We then ran through a number of pedagogical strategies to help motivate students and help them develop productive metacognitive habits, such as self-gauging of actual understanding, goal-setting, and a growth mindset. Handouts: The session made use of a student motivation grid adapted from Ambrose et. al. (2010), and strategies and resources are on the session handout. But documents may be accessed by Columbia affiliates. This session focused on you the instructor in two ways. First, we’ll explore what opportunities you give your students to check in on their own progress and explore how helping your students recognize what they know (and what they don’t know) can help you as an instructor. Second, we reflected on the strategies you use to identify gaps in your knowledge and think about how we might share those strategies with students. In this session, we explored how we teach metacognitive (self-monitoring) strategies to our students to help them build agency and control around their learning and success. We discussed tools to build students’ self-awareness of their language abilities and strategies for cultivating student buy-in to reflective processes like these. In the next session, we’ll explore how issues of identity (e.g. novice or beginner, native speaker or non-native speaker, etc.) factor into the motivations and roadblocks students face. Instructors and students carry into the classroom a range of emotions, moods, and attitudes that have direct and subtle impact on what students learn and who feels included. What strategies can we adopt to to ward off boredom and discomfort – and instead cultivate enthusiasm, pleasure, and even awe? Join us to consider experiences from our own classrooms and explore models of motivation, belonging, and marginalization. We embrace the diverse identities our students bring to the classroom. How then do we work with our students, their genuine motivation to learn a new language, and their enthusiasm to dive into the cultural products enveloped in that language, when their identities are not represented in our textbooks and class materials? How do we help students navigate a new culture, prepare them for studying abroad, or even prepare them to represent their own identities, if and when the second language lacks the linguistic choices available to them in English. The theme for Fall 2017 Teachers’ Lounges was Inclusive Grading. All too often, grading is exhausting for instructors – and intimidating or ineffectual for learners. This semester our conversations explored creative approaches to grading that lessen burdens on graders and increase student agency and morale. These Lounges fit broadly into the CTL’s focus this year on ways to inspire students to take more ownership over their own learning. This session focused on peer editing and peer review activities as drivers of learning. After a meta-taste of peer assessment, during which participants reviewed and offered comments on each other’s written statements about the benefits of peer assessment, we shared thoughts and discussed research in this area. In particular, we considered the learning benefits of offering feedback to a peer as well as receiving feedback from a peer. We then turned to consideration of variables in the design of peer assessment activities. Slides: the session presentation slides include a list of pertinent resources. Handouts: Flavors of Peer Review, drawn from John C. Bean’s Engaging Ideas (2011), and Peer Assessment of Group Work, guidance from CTL’s Collaborative Learning workshop series. In this session, we considered ways to actively involving students in the assessment of their own work, through tactics such as creative test design, open discussion of the criteria for participation and discussion, and the co-construction and co-application of rubrics or other grading criteria. Slides: the session presentation slides are rounded out with a list of pertinent resources, including AAC&U Value Rubrics. Handout: Building a Rubric, which adapts guidance from Stevens and Levi’s Introduction to Rubrics (2nd ed., 2013). This session will rounded out our conversations for the semester with some thoughts about academic integrity and the advantages (and perils) of giving students control over assessing their own work in a class. After a consideration of the level of trust we have in students’ ability to accurately assess their own work, we considered the efficacy of honor codes (include Columbia College’s honor code), models for student self-grading (such as specification grading and exam self-grading), and the exhortations of educators who have gone gradeless. Slides: the session presentation slides include a list of pertinent resources. Continuing our exploration of inclusive teaching techniques and challenges, Spring 2017 Teachers Lounges considered approaches to class discussion that genuinely engage a diverse range of students. In what ways can class discussion move beyond a simple call-and-response pattern? When and how can an instructor let students take conversation into unpredictable directions? How do we manage offensive or divisive comments? This semester’s Lounges drew on the work of Stephen Brookfield, Donald Finkel, the University of Michigan’s Center for Research in Learning and Teaching, and the Ford Foundation Difficult Dialogues in Higher Education series. In this session we considered times from our own experiences when class conversation has turned painful or offensive, and looked at situations described by participants in the February, 2016 Inclusive Teaching Forum at Columbia University. Drawing on tactics for planning discussions on controversial topics published by the University of Michigan’s Center for Research in Learning and Teaching as well as the Ford Foundation Difficult Dialogues in Higher Education series, participants considered ways to manage difficulties described in these Columbia scenarios — and even leverage them for increased learning. In Fall 2016, Teachers’ Lounges considered Engaging International Perspectives in the Classroom from various perspectives. Participants considered opportunities and challenges presented by the increasing presence of international instructors, students, and curricula at Columbia and other global universities. The CTL coordinated with faculty and campus organizations supporting international instructors and students, such as the American Language Program and the Office of Multicultural Affairs, on Teachers’ Lounge conversations about the way global perspectives are facilitating and shaping learning at Columbia. Topics and session materials are below. Sept. 28: Perspectives of International Teaching Assistants at Columbia. A discussion of experiences, discoveries, and teaching strategies of international graduate students. What has been surprising about the habits and assumptions of Columbia undergraduates? And how can the insight of international instructors help develop critical perspectives on the American classroom? Alan Kennedy, International Teaching Fellow Coordinator in the American Language Program, joined us for this open conversation. Session slides, scenarios, intercultural pedagogy strategies. Oct. 19: Bringing Students into International Spaces. This session discussed the extension of learning activities into “international spaces”. Erica Avrami, Assistant Professor of Historic Preservation in the Graduate School of Architecture, Planning and Preservation, shared insight from bringing Columbia students to sites in Haiti, Uganda, and elsewhere; and Reyes Llopis-Garcia, Lecturer in the Department of Latin American and Iberian Cultures, discussed extending international language study into engagement in the ‘super-diverse’ environment of New York City. Our conversation was framed by consideration of what it means to ‘internationalize’ the learning experience. Related resource: Schoorman, D. (2000). What really do we mean by ‘internationalization?’. Contemporary Education, 71(4), 5-11. Nov. 16: Perspectives of International Undergraduates at Columbia. In this final session, the Lounge will be visited by undergraduate students on the International Student Advisory Board (ISAB). They prepared a video ahead of time, and two ISAB members shared perspectives on being an international College or SEAS student at Columbia these days. Since this Lounge is our first meeting after the 2016 presidential election, we also checked in on that front and previewed upcoming conversations. This semester Teachers’ Lounges were organized around discussions of identity, inclusion, and diversity in the classroom. We are discussing topics such as inclusive curricular design, stereotype threat, social environments in the classroom, disabilities and learning, and the interplay of various identities (race, gender, sexuality, nationality, class) with instruction in various subject area domains. In the first Lounge of the semester, we thought about how instructors define inclusivity in the classroom, reveal or hide aspects of their own identity, and try to avoid playing favorites. Discussion touched on the Project Implicit website, the newly released study TAs Like Me: Racial Interactions between Teaching Assistants and Undergraduates, and ‘A Little More Every Day’: How You Can Eliminate Bias in Your Own Classroom, a recent advice piece in the Chronicle of Higher Education. During this Lounge, we discussed approaches to building a sense among students of inclusivity, investment, and community in a class. Discussion referred to models promoted by Jay McTighe and Grant Wiggins in Understanding by Design and by Carol Dweck in Mindset: The New Psychology of Success. Loungers discussed specific tactics for drawing diverse students into full participation in class, noting complications and perils along the way. This Lounge considered stereotype threat and its effect on learning. After watching a video of Dr. Claude Steele discussing his research at Columbia University, we discussed visible and invisible identities, and how these identities are affected by threatening and reassuring contingencies in the classroom. Our talk drew on resources available at http://www.reducingstereotypethreat.org. Slides accompanying this Lounge are available to Columbia affiliates here. The timing of this Lounge inspired us to tackle strategies for effectively documenting diversity and inclusivity on the academic job market. After sharing some inclusive teaching practices we’ve implemented in our own classes, we considered entry points for writing a diversity statement with our guest facilitator, Isabel Geathers, GSAS Assistant Dean for Academic Diversity. Slides that draw primarily from resources developed by Dean Geathers are available to Columbia affiliates here. At a time of the year when many of us were thinking (too much!) about grading, our final Lounge of the semester considered ways to honor variation and difference in the grading process. Our discussion touched on values emerging from the application of Universal Design for Learning (UDL) in higher education, as well as practical ways they can shape ways to assess our students’ learning. Slides from the session drawing from these UDL resources are available to Columbia affiliates here. In Spring 2015, Teachers’ Lounge discussions focused on unpacking educational buzzwords that find their way into conversations about instructional practices and statements of teaching philosophies. What do we really mean by them? How do they actually apply to specific disciplines? Our conversation moved between published theory and what we have actually observed in classrooms at Columbia and elsewhere. A critical look at the term “critical thinking,” with discussion of how this skill is imparted in actual classes across disciplines. Our conversation drew on Stephen Brookfield’s 2012 monograph Teaching for Critical Thinking. What do people mean by this term? In what ways do we see it being practiced in classrooms — and in what ways is it not? This discussion helped inform planning for a workshop track series on this topic in the Teaching Center. Our conversation touched on Claude Steele’s 2010 book Whistling Vivaldi: How Stereotypes Affect Us and What We Can Do, as well as resources from the University of Michigan on inclusive teaching. In what ways is teaching performative, and how is authority projected in the classroom — particularly by new teachers? A discussion of the way stereotypes, affect, and various signals of a teacher’s identity shape the learning environment. Some of the conversation drew on Parker Palmer’s 1998 book The Courage to Teach: Exploring the Inner Landscape of a Teacher’s Life. This Lounge will inform a follow-up faculty panel on the topic in April. Do we believe in the notion of “Digital Natives”, and to what extent? Does a student population swaddled in broadband and smartphones learn differently? We will debate claims made by Marc Prensky and others, glance at more recent research on computers and cognition, and trade observations about how technology is affecting classroom interaction. Our conversation drew on Michelle Miller’s 2014 book Minds Online: Teaching Effectively with Technology. The last Teachers’ Lounge of the semester considered the utility of final exams, papers, and project. Why do we put students through these paces? Do they really measure what we mean to teach? Do they show us what students truly understand? Our conversation will draw on claims about ‘understanding’ that are made in Understanding by Design, by Grant Wiggins and Jay McTighe.